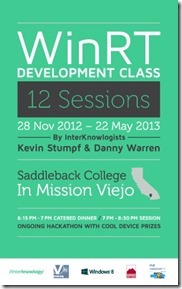 The first two sessions of the WinRT Development class were a great introduction to what Windows 8 WinRT development really is and to XAML development. 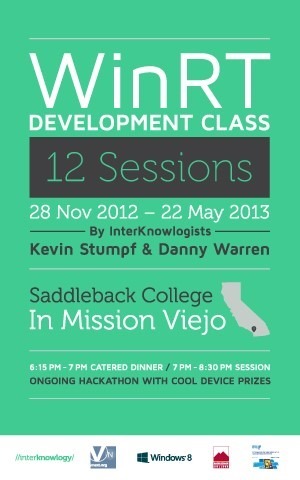 We’re very excited about the future sessions and hope every developer will come learn with us about developing WinRT apps! With the release of Windows 8 and WinRT, I began the process, during RECESS, of porting an existing app we’d created for the Microsoft Surface (the team that is now called “Pixel Sense”) to be a Windows Store application. The application followed more of an MVC (Model View Controller) approach, rather than MVVM (Model View ViewModel), so there we a number of controls that subscribed to the DataContext and Visibility changed events in their code behind, which don’t exist in WinRT. WinRT (Windows Store) applications seem to have many of the same limitations that Silverlight had, compared to WPF, and rather than rewrite the parts of the application to try and avoid needing to know when these DPs changed, I came up with a simple framework to register for a callback when a specified DP changed. The way to get around this issue was actually really straight forward. In each control, I created and registered a DP for each DP I wanted a change notification from (ie. DataContextEx, VisibilityEx, etc…). Then, in the control’s constructor, I bound the created DP(s) to the related DP I wanted to know had changed. With this binding, whenever the source DP (ie. DataContext, Visibility, etc…) changed it would cause the “extension” DP to change and that would call the changed handler I registered when creating the DP. With this I had all that I needed. However, I hated the idea of having to rewrite this code on every control that I needed the notification on. So I decided to create a framework to allow me to register for a changed callback on any FrameworkElement. I decided to go the route of creating a FrameworkElement extension method called RegisterDependencyPropertyChanged that takes a lambda expression for the property to bind to and a callback for when that property changes. The extension then calls RegisterDependencyPropertyBinding on FrameworkElementAttachedProperties. FrameworkElementAttachedProperties is an internal class that holds the functionality to create and register an Attached DP for each type of DP (ie. DataContext, IsHitTestVisible, Visibility, etc..) the user desires a callback for and bind that Attached DP to the DP (using the same process defined under First Solution. Then whenever that value changes it attempts to find a callback registered for it, and if one is found, calls the registered callback with the DependencyPropertyChangedEventArgs provided. Attached DPs are only able to be bound to one property of an object at a time (but can be bound to the same property of multiple objects). This is why an Attached DP is created and registered for each DP of a control as there may be a case where a change callback is registered for more than one property of that control. Therefore whenever FrameworkElementAttachedProperties.RegisterDependencyPropertyBinding is called it calls GetNextUnusedAttachedPropertyForFrameworkElement. This either grabs an existing Attached DP registered for that property, or it will create and register a new one and return it. The registered callbacks are stored in the DependencyPropertyCallbacks Attached DP on FrameworkElementAttachedProperties. By storing the callbacks in the Attached DP, when the control that has registered is unloaded, it can be collected by the Garbage Collector and there aren’t memory leaks. I tend to prefer the MVVM approach, but there are cases when constraints dictate that a different approach is used. This is a nice little addition for when that occurs. Here is a demo solution containing the framework (FrameworkElementExtension.cs) and an example of how to use it. I’ve been playing with the developer preview release of Windows 8 that we got from //BUILD/. Everyday, we find more and more “issues” that are either just straight up bugs, things that are not implemented yet, or maybe even issues that won’t be resolved because WinRT is “just different”. This one was especially “fun” to track down – and when we did, we couldn’t believe the issue. 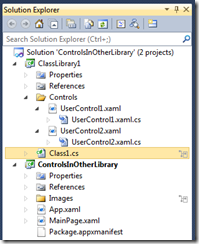 Start with a simple WinRT application in Visual Studio 11. 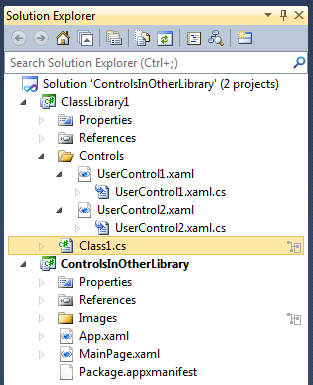 Add a class library project that will hold a couple UserControls that we’ll use in the main application. Pretty standard stuff. Now here’s the key step. Add a new class to the ClassLibrary, say Class1, and have that class IMPLEMENT INotifyPropertyChanged (be sure to choose the right using statement – the one from UI.Xaml.Data). Crazy, huh? The Microsoft guys have confirmed this to be a known bug. I just can’t believe what that bug would be? How is a simple UNREFERENCED class that implements INPC getting in the way of a couple UserControls? When external content is being referenced there is the possibility that the XamlReader won’t be able to find those files, even if they are in the exact same folder as the ResourceDictionary files. To solve this issue, you will need to create a ParserContext and set its BaseUri to the root folder containing the files. For example, if the ResourceDictionary and content files are located in a folder called RuntimeResources, which is in the same folder as the application’s exe, then the BaseUri needs to point to that RuntimeResources folder. Then when the XamlReader loads the ResourceDictionary, it uses the provided ParserContext to know where to look for the actual files. NOTE: In the ResourceDictionary you will still need to include the root folder (RuntimeResources) at the beginning of the uri otherwise it will look in the parent directory for the desired file. Now you’ve got the ability to change your WPF application’s styling at runtime. The DataContext is one of the most important parts of the WPF data binding system, especially in MVVM applications. Being built into the Binding type as the common source for bindings in a specific scope reduces plumbing code needed and makes XAML more concise. Unfortunately, for any given element there is only one DataContext available to bind against. Most of the time this isn’t a problem, but complex data hierarchies often lead to situations where an element needs to bind to the DataContext of some parent element in addition to its own local DataContext.